The Polnet® ACP Series 2.0 is the latest version in industrial grade automatic call processors designed to eliminate dedicated phone lines by expanding the number of devices you can connect to a single line. The Polnet ACP 2.0 automatically answers the line and determines where each call should be routed. 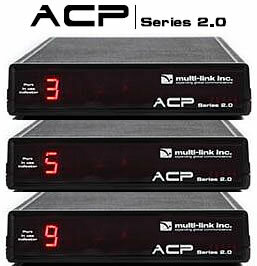 There are 3 models in the Polnet ACP Series 2.0 line. The (1.) ACP-300 has three device ports. The (2.) ACP-500 is for up to five devices and the (3.) ACP-900 handles up to nine devices. All three of these products use only one phone line. You can see eliminating 2 to 8 phone lines can create significant savings fast. "Data Polling" calls that produce the proper security access code (DTMF tones) get routed to the assigned modem or device for each code. The Polnet ACP 2.0 also detects CNG tones for automatic routing to fax equipment. If no tones are detected, the Polnet ACP routes calls to a phone or phone system. *Note: All prices include FREE shipping and handling in the US and most of Canada. We reserve the right to charge up to the actual price of shipping on all orders outside the continental United States. All US orders shipped UPS Ground unless specified. All Canadian orders shipped USPS Priority Mail unless specified. For air and express shipments, appropriate charges will be applied to your order. The Polnet® ACP Series 2.0 is made in the USA. Interested in purchasing the Polnet Series 2.0? Questions about the Polnet ACP Series 2.0?